Okay, i was playing Chrono trigger DS (and Black sigil blade of the exiled) and then i was thinking how it would be better if the materia system was better made. then i remembered that Sephiroth's materia is naturally locked, but it can however be made unlocked or edited with wallmarket. so, the idea came to me to make everyone have fixed materia, but each person have their own elemental affinity, and for limit breaks, they could be changed to have a cetain element to them. but, like some materia naturally needs to go to a certain level to unlock the spell, we could fix the materia to become usable at certain AP growth. Cloud could be earth elemental and learn skills like double slash. all materia 'useless' at 0AP. then at 50AP, 'bolt' becames usable. it can be set up so that all the base spells are learnt, then the higher spells and skills becomes available in such a way. That said, I do like the idea of all the characters having special, non-limit attacks, and like you I got that idea after playing Chrono Trigger. I just don't think it would be easy to do. Oh, and I think you'll be able to make materia that forces the player to level up before any spells can be used (the same way that Ultima does) by using WallMarket. Remember that Cloud's materia are fixed to him at the beginning of the game? Because you cannot access materia in the menu to start with? It finally becomes accessible after Cloud explains the materia system to Barret. Edit that part of the game out using Meteor and all your materia will probably be fixed forever. That is, unless you remove all of them when the game gives you the option at places such as right before the battle with Rufus. This could be a good idea, but it has its limitations. To have materia fixed to Cait Sith and Vincent, you have to alter their initial status, and that means modding the executable. Also, all the materia you find in the field will be useless, as will the materia stores. well, i got the fire materia to work as i intended it to! yay! Is it possible to make ALL materia unmovable? The only thing thats actually really 'stopping' my plan currently is that I can't lock the materia since i seem to have everything else currently sorted. Although if 'worse' comes to worst, i might just increase the strength of the initial weapons and try to use the same basic coding sephiroth has to make no equipment changes possible, but that is just a worst case scenario. using wall market, we can change the initial data that each person has, including what materia, limit breaks, weapon, armour and assecory they have, and some other misc things, so using that, we can define who has what materia. as for the materia stores and field materia... if people want to waste their time buying materia they can't use, i'm not about to stop them. That's actually how I play the game right now. I always leave Cloud with the Lightining and Ultima materia, inspired by Chrono Trigger. Also, I limit it to only one of each materia in my inventory, and summon is a no-no. I know all about Wall Market, but it cannot alter the initial data of Cait Sith and Vincent, because that is stored in the executable to make way for the initial data of Young Cloud and Sephiroth (why didn't they just use separate character slots for those two!?). If you absolutely must lock equipment as well, giving them Vincent's Death Penalty effect will prevent even the Buster Sword from becoming obsolete. You can also given them Barret's Missing Score effect so that the weapon powers up with the AP rather than with the kills. Armor cannot power itself up. But you can always make Guard Sources and Mind Sources more available. Also, by having fixed equipment, each character can have a certain "gimmick". Examples: Cloud's weapon can inflict darkness, Barret's armor can absorb fire, Tifa's armor can protect against confusion, Aerith can have automatic barrier and mbarrier status, Red XIII can have automatic haste status, Vincent's weapon will never miss, etc. This can easily tie in with elemental affinities. still, using a hex editor isn't that difficult. if we do the kills aspect, eventually would we not have the damage being too much for the game to deal with as we all probably saw with the 'zomg i killed the emerald weapon in under 10 seconds' videos that seem to be all over youtube? but even if we can change weapons, we can still have gimmicks, although off hand, does anyone know the method needed to make equipment impossible to tamper with? which leads me to think that if we make it so it can't be tampered with, even for bits like the rufus fight, nothing would happen if we told it to remove all materia. That would be great. After Wutai, when Yuffie randomizes your materia... that would be disastrous. Both the AP and the kill gimmicks can go into overflow and instantly kill enemies if you power level them... but that takes a very long time to do. You could also increase the availability of Power Sources and maybe Luck Sources... and perhaps explore some other things. Perhaps there are some spells that cause physical damage for 0 MP. You could also make some weapons ignore Barrier, or an enemy's defense, or edit the HP divisors so that Limit Breaks charge very quickly. Sephiroth's locked materia is field edited and can't be done with Wall Marked. Try Meteor. Removing the ability to access materia solves this problem. Just have equal numbers of slots on all weapons and armors, and voila. There you go (after some materia editing). Not hard at all. Hm, if anyone wants to help me out with merely removing the part that adds the materia menu with meteor, i'd appreciate it, since i don't seem to be able to make meteor work without crashing the game entirely. or tell me how to do it and then reinsert the data into the flevel without it crashing? edit: okay, it appears why it always crashes is because i don't compress the edited scene with fice.lzs. but i can't really think of too many materia for him to actually have. and i'm currently messing around with different things, these are my current findings using the 'simple' method. normal magic = works 100% with the changed system. if anyone has any suggestions for materia setups, i'm open to them. here's my 'list' of what element i want for each person. i love the idea of having unique character elements and abilities. vincent-is there a dark element? Argh, it seems like i don't know what i'm doing in meteor, initially i removed the notice saying we could now use the materia menu, then at that point in the game, garbled text and the game hanged. then i went into it again and took out the 'mes' bit that i thought may have been the new menu thing, but that made the game crash. but i'll properly make materia set ups later. sent a pm to you xelane. i'm sure someone here can help, or you could look for the person who made meteor? hey murak, you know how to make a patcher and/or someone who can do it right? just want to be sure, if you can't i can look for someone. You know, elemental materia are not incredibly useful for this mod. You can give the weapons themselves elements in Wall Market. Same with armor and accessories. Only reason you might want to throw in an elemental materia is when you want the character's elemental strength to gradually increase. May I make an elemental suggestion? That's pretty similar to the list you have already. Keep in mind that there are 16 selectable elements in Wall Market, and if you wanted to, you could create a whole new element (such as Darkness, as an element opposing Holy) from Hidden. 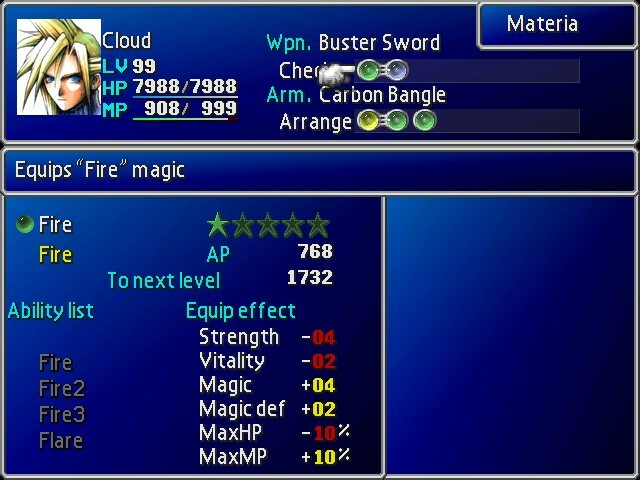 If you wanted to give each character certain status effects that they can inflict with their physical attack, you can assign the weapons one status effect each... but to inflict more status effects, you must use an Added Effect materia. well ideas aside, the only difference is that red and barret are switched. other than that i believe that elements should not be added to weapons, but it can be useful. I've always thought of Red XIII being earth elemental because of where he lives and also that Earth Rave limit break. It was only a suggestion. But if you do make Barret an Earth elemental person (meaning that he dishes out earth damage), then there'll be a slight problem. He's always going to miss flying creatures, which is ironic because he is one of the three characters with long range weapons. point taken in that aspect, let's see. what else fits a big, hulking black guy with a renegade attitude? i would expect that his attack wouldn't be earth, just his magic. its like giving a guy named "pyroguy" earth abilities. besides it makes sense to not have an affinity to weapons now that i think about it. how would you kill ruby weapon when your attacks heal it? If there is even one enemy that negates or absorbs Fire, Ice, Lightning, Water, Earth, Wind, Holy, Poison, and Gravity (and it is possible for enemies to be immune to all of those at once), then yeah, that's a problem. In that case, either don't make the weapons themselves elemental or else weaken whichever enemy that is.